We’ve just come off of a two week break from school and this morning I was shocked and annoyed to realize that I would have to start packing lunches for my kids again. What?! Yep — it’s a fact. I write a blog that focuses on packing lunches, and I even wrote a book about about bento lunches but I still sometimes view lunch-packing as a terrible chore. Over the years I’ve found that after a break like this it’s really hard for me to get back in the groove of making lunches every morning. Go through the Lunch Box Idea List and select a few items from each category for the week’s lunches. My copy is hanging on our fridge and even though I’ve read through it hundreds of times, I often get ideas for refreshing the lunch repertoire just by scanning through it. Next I figure out what we have in the fridge/cupboard that needs to be used up. This week we have a ton of celery and a monster bag of grated cheddar that we haven’t been going through as fast as I thought we would so I’m going to put those in the lunches for sure. Dedicate a portion of the shopping list to lunch items. When I make a grocery list I tend to have a laser focus on dinner ingredients, but taking a few minutes to write down some specific items for lunch makes it less likely that I’ll forget to get enough veggies or deli meat or anything else I need for filling the lunch boxes. Ask the kids what they want. They often have good ideas and they’re more likely to eat their lunches when they get to contribute their ideas. This week my boys are all about apples and bananas and my five-year-old surprised me by asking for cantaloup. Good idea, Augie! I’m flexible when I shop. If I get to the store and the apples are cruddy looking or expensive or whatever I buy a different kind of fruit instead. Likewise, if I was planning on picking up goldfish crackers, but the Saltines are buy-one-get-one they are the ones going in the cart. 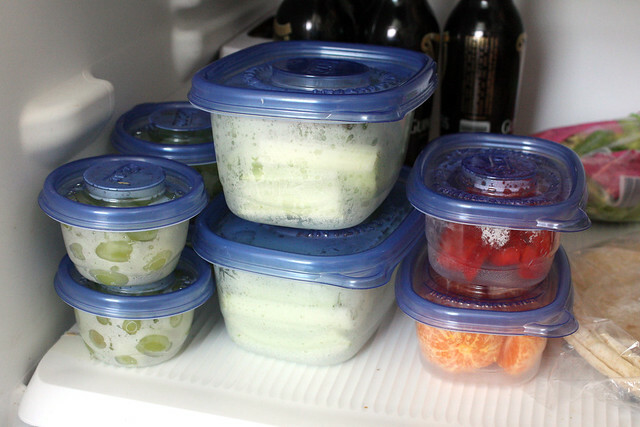 Once I have my lunch pantry stocked, it’s easy to assemble healthy, varied lunches every day. I don’t have to hunt for food to pack and once I pull out an item from each category everything comes together lickety split. Once you get all those fresh fruits and veggies home, take a half hour to clean and chop them. I don’t do this every week, but I am so glad when I do! I wrote a whole article about the many ways prepping in advance makes our lives better last year (5 Fantastic Side Effects of Prepping Produce in Advance) but the #1 item on that list is that lunch packing takes about half the time. If you have the time (and energy) it’s also helpful to make one or two lunchbox-friendly recipes at the beginning of the week. Muffins are easy and homemade granola or cereal bars will save you a ton of money if these are items your kids eat regularly. This week I made a batch of Lemon Parmesan Popcorn from the December Cooking Light and I’m planning to include this healthy, whole grain in the boys’ lunches a few times. Sometimes the problem with packing lunches is that we’re tired of putting the same foods in boxes day after day and our kids are tired of eating the same foods day after day. Shake things up with some fresh ideas! I’ve enjoyed the shot of inspiration I’ve been getting from three books that were released in the last few years, The Best Homemade Kids’ Lunches on the Planet , Weelicious Lunches and Beating the Lunch Box Blues . For decorative bento ideas, I also turn to a couple of old favorites, Yum-Yum Bento Box , Hawaii’s Bento Box Cookbook (this book is currently out of print, but easy to find used) as well as my own book, Everyday Bento: 50 Cute and Yummy Lunches to Go . And two books I have my eye on but haven’t picked up yet are Best Lunch Box Ever and Easy Lunchboxes – Cooking with Trader Joe’s Cookbook . Another great place to find inspiration is the Momables lunch menu service. For roughly $5/month (depending on your subscription plan) you receive a weekly menu plan with five healthy, lunch box-friendly recipes, suggestions for sides and a printable shopping list. You can always click over to the Wendolonia Bento Box Gallery where you can view over 2000 photos of the real-life lunches I feed my kids. Click the tags on the right-hand side to filter the lunches by age, food, theme or a specific type of lunch box. And finally, our old pal Pinterest is a great place to turn for lunch inspiration! Search for “bento box” or “lunch ideas” or start at the Bento Bloggers and Friends board which is a treasure trove of bento ideas. Packing lunches is no fun if your gear is worn out or if you’ve realized it doesn’t really work for you or your kids. I finally replace one of our worn-out, ripped-up, duct-taped lunch bags with a fresh, new sporty one and the kids are both excited to take it to school. If you’re unhappy with the lunch boxes you’re currently using, it might also be worth taking a look at this detailed lunch box comparison chart to see if there might be a better option for your family. I know I also get more interested in packing lunches when I have some fun new bento tools to play with. Maybe buy a new set of themed cookie cutters or check out some cool and not-too-expensive bento accessories from Japan. How do you get your lunch-packing groove back? I’d love to hear any tips in the comments!